A ROOM to give children a calming and quiet space has recently been completed at Whitford Catholic Primary School. Paint Me A Rainbow created the Rainbow Room at the Craigie school for students who have autism to help with their daily self-regulation or for those who need a safe space. 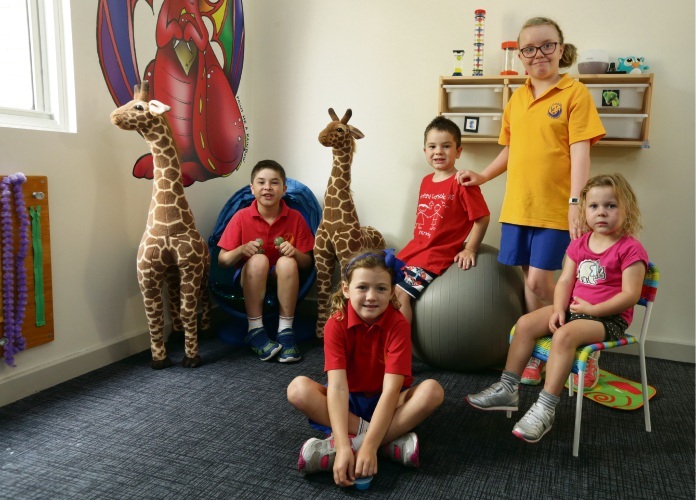 School mum Kylie Beveridge, who formed Paint Me A Rainbow to bring colour to autism awareness, said they were able to create the sensory room with the profits from the campaign they hosted last year as well as from donations from local businesses. Assistant principal Cath Hughes said the room had a range of stimuli to help students develop and engage their senses. “It has proven to be a beneficial addition to the school as it supports the child in regulating their emotions,” she said. “This has a positive impact on the child’s self esteem, confidence and ability to interact with the world around them. Mrs Beveridge thanked board members Bruce Beveridge and Leaha Muntean for their time and energy into creating the Rainbow Room, as well as donors Signarama Joondalup, GoTroppo Aquariums Wangara, Ikea, Woodvale Fish and Lily Farm, Easy Decals, and Freeze Frame Photobooths and Photography. Paint Me A Rainbow will again run its autism awareness campaign at Whitford CPS, as well as St Luke’s CPS in Woodvale, St Helena’s CPS in Ellenbrook, St Jerome’s PS in Munster, Rivergums PS in Baldivis and Cooloongup Primary School. The campaign will start on April 1, which marks the start of World Autism Month, and aims to raise funds for the participating schools to help students with an autism diagnosis. At Whitford CPS, the campaign will run for a week with students taking part in autism awareness activities such as colouring competitions, quizzes, classroom discussions and film screenings, culminating in Rainbow Day where students can wear their favourite colours and buy cupcakes at recess. In the July school holidays, Paint Me A Rainbow will also team up with Shobukan Martial Arts to host a Members and Mates Self Defence and Protective Behaviours class.